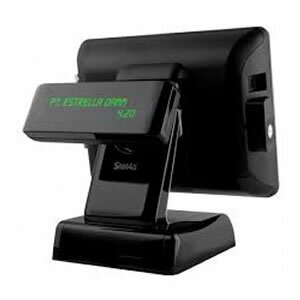 EPOS Systems are available in various form factors. The best EPOS System form factor for your business will depend on how you will identify the products & services that you sell, the speed and efficiency with which you intend to process transactions, cosmetic considerations, how much key-entry is required (eg. customer names and addresses) and your budget. In all 5 types of epos system, the additional peripherals (cash drawer, receipt printer, barcode scanner, pole display) will be connected as external devices, although some integrated terminals sometimes include a built-in receipt printer, barcode scanner and rear customer display. The two Integrated solutions provide the tidiest cosmetic solution with less cables and a more co-ordinated, professional look. Obviously, they are also slightly more expensive. Depending on the type of business you operate, you will select your products and services at the point-of-sale in different ways. For example, by scanning a barcode, key-entering a product code, pressing on-screen graphical menu buttons or selecting from a list. In the latter scenario, especially in bars, cafes and restaurants, a touch screen is much effective. If you are operating a trade counter where you key-enter account customer details and carrying our relatively fewer daily transactions, it may be more practical and cost-effective to use conventional PC with a keyboard and mouse. Windows-based EPoS software tends to be more comprehensive and you can upgrade or replace the EPoS software in the future without losing your hardware investment. You can also choose your own size and specification of touch screen terminal (12", 15"). You also have the benefit of being able to install and use any other Windows-based applications on the same computer and connect it to the internet. You can have either USB ports, memory card slots and/or a CD drive for data backup. Flash memory based systems are near-silent in operation as they dont have noisy fans, hard disk nor a Windows operating system, they are faster to startup and generally more reliable in the long term. You cannot install other program applications so in that sense it is limited but then also more secure. They have either SD slots or USB ports to backup data. The size of the touch screen is fixed by the manufacturer, as is the software functionality, processor, memory and peripheral options. On some systems, it is possible to expand the memory capacity. 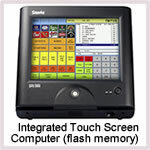 EPoS systems on a conventional Windows computer or a compact EPoS computer with keyboard and mouse provide a low-cost alternative to integrated touch screen systems. 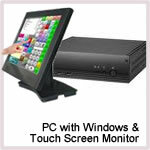 If you already have a Windows PC, then connecting a stand-alone touch monitor to that gives a further operating advantage at a lower cost than having to buy a fully integrated touch screen system. Domestic grade equipment such as Apple iPads and similar tablet devices are not designed or built to withstand constant and harsh usage in a busy commercial environment so are not ideally suited for business use. The screen on these type of devices can break very easily if dropped or knocked and they are not very resistant to liquid spills or grease, and they have limited battery capacity when compared to more rugged commercial-grade equipment. However, add on accessories to ruggedise the device and make it waterproof can help circumvent these issues. See our Hi-Sense Tablet EPOS System for tablet based restaurant EPOS solutions. Our Q5 hospitality system also supports WIndows-based Tablets. 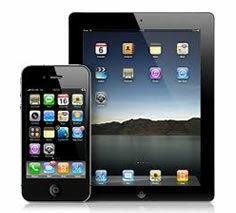 Also see our new V4000 restaurant epos solution which supports any iOS or Android device for wireless waiter use. We recommend using rugged waterproof devices or casing, with at least 7" screen size. We also offer the Honeywell Optimus S series of handheld PDA's for use with our retail EPoS systems for stock taking and receiving goods. 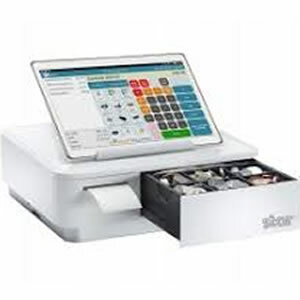 These handheld devices are variously used for stock taking, wireless waiter terminals where tables orders can be instantly transmitted to the kitchen for printing and for field sales staff to take orders and check stock levels. EPOS Systems are usually operated locally - where the program and data is stored locally on your own equipment. However, there are also Web-based POS solution providers where the application software and/or database is hosted on a remote web site, referred to as cloud computing. We do not supply cloud-based POS systems at EposSystems.Com for a number of reasons explained below, not least due to their slow operation which can severely hamper a fast-paced trading environment. If you require a Wireless POS system without the risks of cloud-based systems, then see our HiSense non-cloud EPOS Solutions, Q5 EPOS System and our V4000 Restaurant EPOS System. We do supply Web Ordering Systems that host a food ordering website for your consumer customers to use on their own desktop computer, tablet or smart phone for ordering from your food delivery business and making secure payment. Orders are then instantly transmitted to you, either by email or printed on a ticket printer. 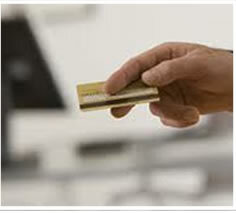 With the Q5 system, orders an be sent directly from the website to the epos system in real-time. Usually cloud based EPOS systems require a permanent internet connection for each workstation at the sales outlets, although some do have an 'emergency' mode which will run a local application that temporarily allows transactions to be batched locally in the event of a connection failure. As you are community through extra layers - your router, your internet, the providers website, the providers application, the providers database - cloud based systems are substantially slower in operation than locally installed systems. These web-based solutions have the risk of dependency on the providers website reliability, your own internet connection being reliable and of course there is the ability of the provider to instantly disable your access to the POS system should they choose, for example, in the event of a dispute over charges or future price increases. Your live most up-to-date business data will never physically be on your own local computer with a cloud based system, it will always be held by a third-party, sometimes in another country. You will never own the EPoS software license outright - you will need to keep paying a periodic subscription indefinitely to use the system and access your data. Most good EPOS systems have a typical life of 8-10 years. Systems sold by EposSystems.Com do not require a mandatory support subscription to be paid every year so there are minimal ongoing costs. When comparing the cost of cloud based EPOS systems, you should look at the total cost of your monthly / quarterly payments over, say, 5 years, for just use of the software and then add to this the hardware and peripherals you will still need to purchase initially. For example, if you paid £40 per month, then over 5 years you will have paid £2400 just for use of the software, and you would still not own the license. If you then add the cost of a touch screen terminal (approx £900), a receipt printer (approx £150), a cash drawer (approx £60) and a barcode scanner (approx £150), you will pay a further £1260 for new hardware. 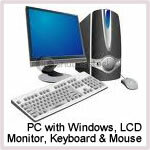 Total for 1 workstation, £3660. The media have widely reported security breaches in government information systems where confidential patient hospital records or prison records have fallen into the hands of third parties or sold by corrupt internal staff or ended up on overseas servers or left by clumsy employees at a train station. If secure government systems security can be breached, then commercial systems can be infiltrated too or be the subject of human errors. Are you happy to allow all your own customer database, accounting records, transaction records and other historic business data to be in the possession and under the control of a private third-party? Would you be prepared to engage in expensive litigation, possibly in another country, waiting many months, if you were denied access to your own data in the event of a dispute or if the cloud service provider closed down? In some countries, tax authorities may be able to gain direct access to your business data held on a third-party server if legislation permits. Whereas most businesses prefer their own accountant to firstly check and verify all transaction data before submitting tax-related accounts. By definition, cloud computing allows access to your data from any internet connection anywhere in the world. That also means data held on cloud servers may be prone to hacking attempts by anyone. Your business data - consisting of customer listings, supplier records, transaction data, payment information etc - held on a physical server that may not even be owned by the software provider, could be hacked into by anyone on the internet anywhere in the world. Regardless of what promises anyone makes, no server is 100% hacker-proof, even US military systems and major IT companies are routinely hacked into. It is unlikely that the application software provider directly owns and manages the computing infrastructure that hosts the software and stores your data. This will usually be contracted to a specialist hosting company. In turn, the hosting company may have distributed data centres in different parts of the world and your data could be moved from one site to another. This creates huge complications as far as legal jurisdiction is concerned. It also means sets of internal staff have potential access to your data and the risk of a rogue employee from any of these several computing sites using your data is increased. Many providers of cloud based systems promote the automated availability of program enhancements as a selling feature of this type of system. In reality, the most stable and reliable systems are those systems which have been established for many years, are comprehensive in features and have been proven, tried and tested and thus do not require frequent updates to add missing features or to fix bugs. With any program updates, whether from a multi-billon pound corporation like Microsoft or from any smaller software provider, there will always be teething problems and bugs in new versions. Providers who promote frequent program updates should therefore be treated with caution as it can be a mark of instability or incomplete software and lead to a period of downtime or operating glitches each time an upgrade is installed or attemptedly rolled out. With cloud based solution providers, the main advantage to the provider is the collection of ongoing sales revenue indefinitely every month/quarter from the business user. There is not necessarily any price, performance, reliability or security advantage to the end user. If you do not run a fixed retail or hospitality operation but instead run a field based or mobile operation, then in those circumstances cloud computing may give you an operating benefit as your staff will be able to conduct sales and crm functions remotely wherever there is internet access. But if you run a fixed location business, then cloud systems have many risk factors to take into consideration. With a locally installed EPoS system, your system will continue to work if the supplier closes down, although you may need to find another dealer if you require future software upgrades or hardware maintenance. But with cloud based systems, your reliance for continuation of your business is totally on the application software provider and their sub-contracted infrastructure providers. If one or all of them close down their business, you may lose access to your EPoS system and your data. So the life of your EPoS system and your access to your own business data is reliant on the survival of the software provider and their subcontractors. In a financial climate where major names like Woolworths, Polaroid, Swiss Air, HMV, Comet and Enron can go bust and international banks have had to be bailed out, no software supplier can claim immortality. What will happen to your EPoS system and access to your most up-to-date data if the cloud based provider goes bust? How quickly could you receive your data, who will pay for its recovery and how long would it take to setup and switch to another system? 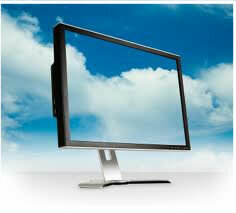 Cloud based EPoS tend to offer SaaS (Software as a Service). They still require you to have your own hardware and networking platform. Claims are made by cloud system suppliers that the business user is allowed to focus on running their business and are spared the time and cost of managing the computer infrastructure. But if you have chosen a stable and comprehensive EPoS software package, there is no need for it to be upgraded frequently. With a suitable capacity disk drive on your server, there is no need for hard drives to be frequently upgraded. And you will still have your client PC's running Windows and internet connections to "manage", local Routers / Switches, local Ethernet cabling, local receipt printers, local hard drives on each computer, local barcode scanners, local power supplies for all the devices, local cash drawers and all of these will still require 'managing' by yourself if you have a cloud based system. The cloud system provider cannot 'manage' any of this equipment or cabling for you any differently than an installed EPoS software provider can. The only thing they can 'manage' is the cloud based aspects, but if you dont choose a cloud based system then there is no management of it needed! As long as you are following the daily process of backing up your data, checking the backup was succesful, making sure the correct files are being backed up and off-site copies are periodically taken and archived, then your business data is secure. There is no guarantee that a third-party will backup your data any more reliably than you, or that will retain it in accesible form on demand. It is good practice to obtain a written statement from your EPoS software provider stating the names of the drives/URL's and folders which contain your business data and system configuration files. These are the folders you will need to ensure are frequently backed up and periodically archived. This is another format, like cloud computing, that is designed to extract ongoing revenue indefinitely from the end business user. We do not sell these type of EPoS Systems either. With Pay as You Go, you either purchase the hardware and peripherals yourself, or you are loaned new or used equipment, and then you pay a weekly, monthly or quarterly subscription fee or per-transaction fee for use of the epos software. The long term cost over, say, 5 years should be calculated when comparing these types of systems. With rental systems you are usually required to pay a sizeable deposit to the provider. This more or less covers the cost to the provider of the second-hand or low-grade equipment given to you. For example, £30 per week may sound simple but it equates to an astronomic £7800 over 5 years! Whereas you could purchase a complete package outright for around £1175-£1400. The same arguments about support and program upgrades are made with regard to ongoing rental payments, but the points above - stable and complete software does not require frequent program upgrades or continuous support beyond the implementation period - apply. Hardware should always be covered by manufacturers warranty in the first 1-3 years on most equipment. Pay as You Go and Cloud based systems may seem attractive if you have a limited budget and dont want to pay the initial capital cost of a system with software purchase or if you operate a mobile business. A seemingly low monthly payment may be suitable for some. But alternative funding methods such as leasing or purchasing a lower-cost hybrid EPoS can also be considered in that circumstance to avoid the risk factors and to minimise the overall long term costs. If you wish to discuss your EPoS system requirements and require additional buying advice, please call us at EposSystems.com on 020 7523 5000. Friday 19-April-2019 23:41 Our office is currently closed. We will be open again from 10am tomorrow.